When the new world you've stepped into is as isolating as the last, when your heart is broken, and your future is unclear, where do you find hope? THIS IS THE SECOND PART, AND CONCLUSION, IN A TWO-PART SIGN OF LOVE SERIES INSPIRED BY AQUARIUS (BECOMING CALDER SHOULD BE READ FIRST). New Adult Contemporary Romance: Due to strong language and graphic sexual content, this book is not intended for readers under the age of 18. 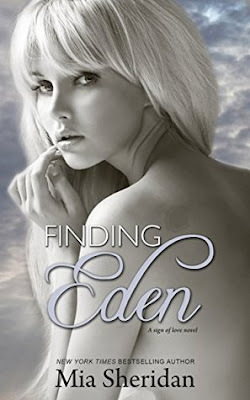 Finding Eden is a beautiful story of second chance romance, the incredible journey of two broken soul to rediscover oneself and their path of healing. FE is everything I want in romance novel-pure perfection of powerful love, dynamic display of emotions and two amazing heart with enormous amount of love, strength and innocence. This is a kind of story you want to live in, it’s filled with lot of swoon worthy and mesmerizing moments. “But what I did know was that I loved a girl. And I knew I loved her in a way I'd never, ever recover from. I knew I loved her to the very core of myself. The story picks up pretty much after the horrific ending of BC. Though Eden and Calder have survived the flood in Acadia killing everyone, they don’t realize the other’s existence until after three years when Eden finally reunites with her mother. Even with the epic reunion of Eden and Calder, they still deal with the ghosts of their past and threat of unpredictable future. With new found family they learn to accept the second chance at life, with each other they learn to comfort and support in their struggle with the new world and to move on from their tragic loss. This story also unravels mysteries of their disappearance and their cult leader Hector. All in all it was an Epic conclusion to a wonderful love story and I loved it! You have the most beautiful heart of anyone I've ever met. I've said it before I’ll say is again Mia Sheridan has magic in her words. Her story is captivating, it’s like she has cast some spell on you with her words, leaving you emotional your heart bursting with full of love and always keeps you wishing for MORE.